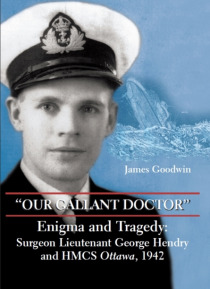 During the Battle of the Atlantic, Dr. George Hendry had just finished performing two major surgical operations on board the destroyer HMCS Ottawa when his ship was ambushed by 13 German U-boats. Canadian warships like Ottawa had inadequate radar sets that were incapable of detecting submarines approaching in the dark. On September 13, 1942, U-91 stole in and torpedoed Ottawa, sinking her in 20 mi… nutes. utterly exhausted, Dr. Hendry was lost along with 113 of his shipmates. George Hendry was a much-loved man, a great university athlete, and a very good doctor. Unfortunately, he was also naive and too trusting. One night in January 1941, he committed a very foolish indiscretion. He would spend the rest of his tragically short life making amends for this mistake.